“Get on Up” entertains and enthralls because just like its subject, the late James Brown, it’s not afraid to break the rules. 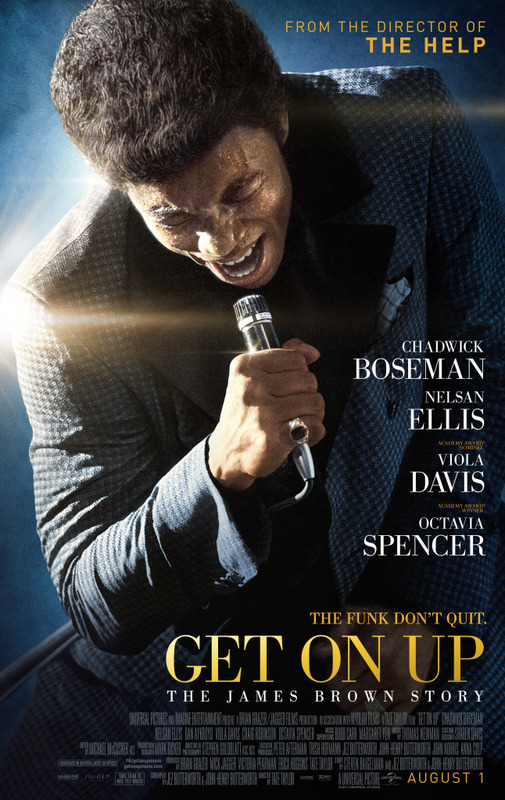 As a film, Get on Up entertains and enthralls because just like its subject, the late, great “Godfather of Soul” James Brown, it’s not afraid to break the rules. Fueled by a performance from Chadwick Boseman that should garner Oscar and Golden Globe attention when awards season rolls around later this year, the film delivers an experience worthy of the unconventional performer whose life story it explores, one full of powerhouse musical performances, vibrant energy, and incomparable style. Rather than attempt a chronological recounting of Brown’s almost seven decades as a performer and musical innovator, director Tate Taylor (The Help) takes an almost stream-of-consciousness approach to the material. He focuses on pivotal moments in Brown’s life and career in non-sequential order in order to better explore Brown’s mentality and attitudes toward work, music, relationships, and most importantly, himself. Central to almost all of those moments is a particular musical performance or public spectacle: the Apollo Theater in 1962, the Boston Garden in 1968 in the tense days following the assassination of Dr. Martin Luther King, Jr., the Olympia Theatre in Paris in 1971, and an infamous high-speed chase and subsequent arrest in Augusta, Georgia in 1988, among many others. In and around those performances and displays are the people who were integral to his journey, whether he’d admit to it or not: his mother Susie (Viola Davis), who left Brown and his father behind when he was 5; his Aunt Honey (Octavia Spencer), who took him in and was one of the first to recognize his potential; Bobby Byrd (Nelsan Ellis, HBO’s True Blood), his lifelong friend and musical collaborator; and Ben Bart (Dan Aykroyd), the Universal Attractions talent agent that helped launch him to stardom and then represented him for almost 40 years. In one way or another, these people, as well as his first two wives, Velma Warren (Jacinte Blankenship) and DeeDee Jenkins (Jill Scott), all found themselves in orbit of Brown throughout his triumphs and struggles, all of them knowing that he was meant to always be in the forefront, and they were always to be just outside of his spotlight. It’s impossible to understate just how electric and mesmerizing Chadwick Boseman’s performance here is. Whether he’s playing Brown as a lanky teenager singing alongside Byrd in the gospel group that would transform into The Famous Flames, or in his prime on stage at the Apollo sending fans into a frenzy with his vocals and footwork, or in his later “Godfather of Soul” years, still a giant on the stage but seeing his personal world and his relationships crumbling, Boseman never falters, never loses command of his grasp of Brown’s manner of speech, his bearing, his inner fire, charisma, and focus. It’s nothing short of transformative — you’ll believe you’re really watching Brown, that it’s Brown talking to you during the moments when the film breaks the fourth wall and he shares his perspective on what’s happening around him and to him. It’s unforgettable work, and again, it merits serious attention when time for Golden Globe and Oscar nominations comes around in a few months. As good as Boseman is, those in the cast around him are just as strong, none more so than Nelsan Ellis, who exudes dignity, character, and quiet strength as Byrd, whose 21-year musical collaboration with Brown resulted in some of Brown’s most iconic music. Byrd in the film is Brown’s counterbalance — he holds his own ambitions, his indignation at Brown’s egocentrism and sense of entitlement, his anger at being marginalized and treated as a simple employee though he stays at Brown’s side for most of the star’s journey, all in check, saying little, but projecting his emotions through his eyes and measured words. When Ellis is on screen, with or without Boseman, you’ll find yourself paying attention. Now because its a biopic and because its central focus is a musical icon, Get on Up invites comparison to two other recent films. Audiences who saw 42 last year will certainly remember Boseman’s memorable effort in the starring role of that film, but comparing his work there with what he does in this film is like comparing a baseball game to a funk concert. In 42, Boseman had to portray a man who had to keep his inner fire constrained, who was forced to channel his explosive emotions into a very limited form of expression, whereas in playing Brown he’s portraying a man whose fire could not and would not be constrained by anyone or anything. 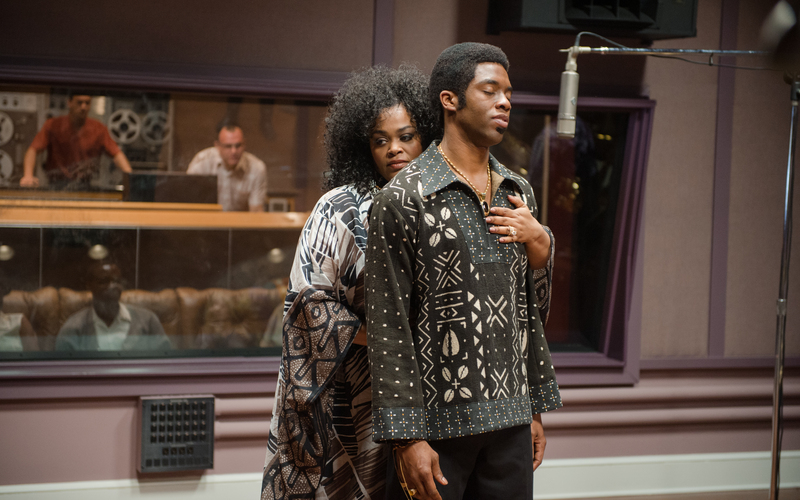 In playing Brown, Boseman is free to explore and express a much wider range of emotion. It’s a much more demanding challenge for the actor, and in his mastery of that challenge, he powers a much more compelling film. The other film that might invite comparison here is Jersey Boys, but with all respect to Clint Eastwood as a director, Tate Taylor does right everything that Eastwood did wrong with his adaptation of the popular stage show. Both films tell stories about musical performers who changed the landscape of music, and both films allow their performers to break the fourth wall and “tell” their stories, but that’s where the similarities end. Jersey Boys feels far more conventional, far more stilted and constrained, and its disparate musical, documentary, and feature film elements never mesh or feel organic to one another. Get on Up, on the other hand, never fails to flow organically, never fails to be reverential to the music yet honest, sometimes brutally so, about the man. Like Brown himself, Taylor as a director doesn’t shy from changing things up, flipping the script to deliver each moment at the point of maximum effectiveness. The technique might take some getting used to, but by the end its difficult to imagine this story being told any other way. Starring Chadwick Boseman, Nelsan Ellis, Dan Aykroyd, Viola Davis, Craig Robinson, Octavia Spencer. Directed by Tate Taylor. Rated PG-13 for sexual content, drug use, some strong language, and violent situations.